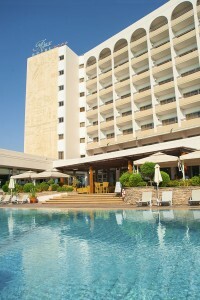 It is fairly easy to get from Larnaca Airport to our hotel in Limassol. You just need to exit the airport and follow the signs to Limassol on the highway ( it’s impossible to miss it). In about 40 minutes, on the highway you will take the exit towards Ayios Athanasios and continue until you reach the roundabout of Ayios Athanasios. Take the first exit to your left towards the city center. You continue driving straight ahead and in 300 meters you will reach the first traffic lights. Keep on driving straight for 100 meters and you reach the second traffic lights. From these traffic lights you need to take right and in about 250 meters you will reach the first traffic lights. At this point you have to turn left. 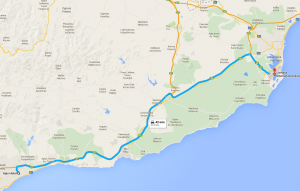 You continue driving and approximately in 800 meters you will find the hotel on the left side of the road. From Paphos International Airport to Ajax Hotel in Limassol, you just need to exit the airport and follow the signs to Limassol on the Highway. In about 45 minutes, on the highway you will take the exit towards Ayios Athanasios and continue until you reach the roundabout of Ayios Athanasios. Take the 3rd exit towards city center. You continue driving straight ahead and in 300 meters you will reach the first traffic lights. Keep on driving straight for 100 meters and you reach the second traffic lights. From these traffic lights you need to take right and in about 250 meters you will reach the first traffic lights. At this point you have to turn left. You continue driving and approximately in 800 meters you will find the hotel on the left side of the road. Cost: €60 per route / for up to 4 persons. €85 per route / from 4 to 6 persons. From Paphos Airport to Ajax Hotel in Limassol, you just need to take the bus route ‘Limassol Airport Express’, from Paphos International Airport towards Limassol City. In about 35-40 minutes you will reach to the final stop of ‘Ayios Georgios Havouzas Church’ where you need to get off. From there you can get a taxi to Ajax Hotel, since its only 10 minutes drive. From Larnaca Airport to Ajax Hotel in Limassol, you just need to take the bus route ‘Limassol Airport Express’, from Larnaca International Airport towards Limassol City. 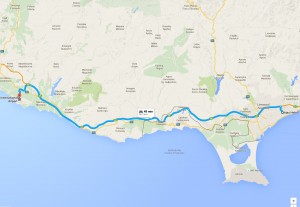 In about 50 minutes you will reach to the final stop of ‘Ayios Georgios Havouzas Church’, where you need to get off. From there you can get a taxi to Ajax Hotel , since its only 10 minutes drive.